Gosh That’s Good! Brand™ - Make any drink an energy drink! 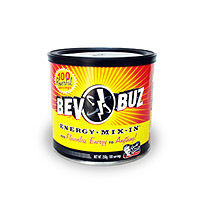 This flavorless powder mix-in dissolves easily making your juice sodas pop smoothies or cocktails an energizing beverage. 100 servings per can! Retailers love it as a cost effective replacement that makes a better blended or mixed drink. No more watered down drinks with limited flavor options. Home use customers love it because you can enjoy any drink you like and get the energy you crave at a great price.